Heather invited me along on a BARE sports dive that her coworker Wendy organized. I couldn't think of a better reason to take a day off work, than to go diving! We were going out with Sea Dragon Charters, whom we hadn't been out with for some time. Kevin and Jan were in Florida, so there was new boat crew with Captain Steve and Bob who was dive mastering. It did not start out to be a promising day. In the morning it was rainy and windy and there were many gale warnings for Howe Sound. Looking out the window I was really thinking we'd have to cancel. But, as so often happens with the weather you have to go and see, so we did. It was a good thing, as we hit a perfect clear weather window. The rain lifted and the wind died down. It wasn't calm, but it was good. We all met at the winter dock where the Topline was moored and loaded things up. On board were Wendy, Darrel, Max, Peter, Arin, Heather and myself. Darrel was finishing some training with Peter, and so Wendy, Max, myself and Heather made the other team. It was a bit of a rough ride out, and Captain Steve was looking for the calmest places for us to dive. We found that the North Pinnacle at Bowyer Island was not bad. It let us tie up as well. We were soon in the water and were greeted by pretty good visibility. I was happy that even with all the rain that there had been there was no cloudy surface layer. 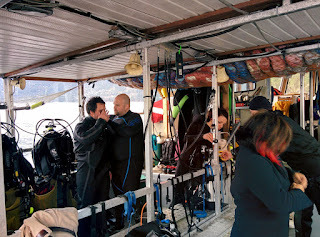 At the bottom of the line, we sorted ourselves out and began our dive. It was quite a lot of fun! Both Wendy and Max were newer divers and had not been boat diving before. We saw ling cod, plumose anemones, copper rockfish and a small Lion's mane jelly fish. I ended up surfacing a bit sooner with Wendy, and Heather finished the dive ascending up the pinnacle with Max. On the boat, we discovered we had inadvertently brought back many Alaskan Skeleton shrimp that were covering the line. They were quite tiny and stuck to you like glue. During the dive briefing, Bob asked us to keep an eye out for a dive computer that had been lost. We didn't see it, but Bob actually was able to find it! It was an excellent example of recovery diving. We warmed up some, and headed to the next dive site. The weather opened up more, and there was even some sunshine! We settled on the north side of Bowen island at a place called Stairway to Heaven. I had dove it before, and my friend Jason Kolba always commented it was one of his favorite spots. Wendy went with Darryl and Peter this time to work on some skills, and Max needed to warm up more, so Heather and I hit the water. Stairway to Heaven was great. We saw schools of perch, copper rockfish, a painted greenling and a very cool anemone. Heather got a good picture. We also found a very pretty rhinoceros crab. And here was a short video clip Heather got of the same crab. Normally we didn't take pictures of sea cucumbers, but this one was small and cute. Finally, a good picture of a vermilion star and some green urchins. We found a very large yellow nudibranch. A cool spidery longhorn decorator crab. A very pretty painted anemone. Tons of (probably) snail eggs covered the rocks. A small cute sea lemon. By the time we surfaced and got back on board, the light was fading fast. 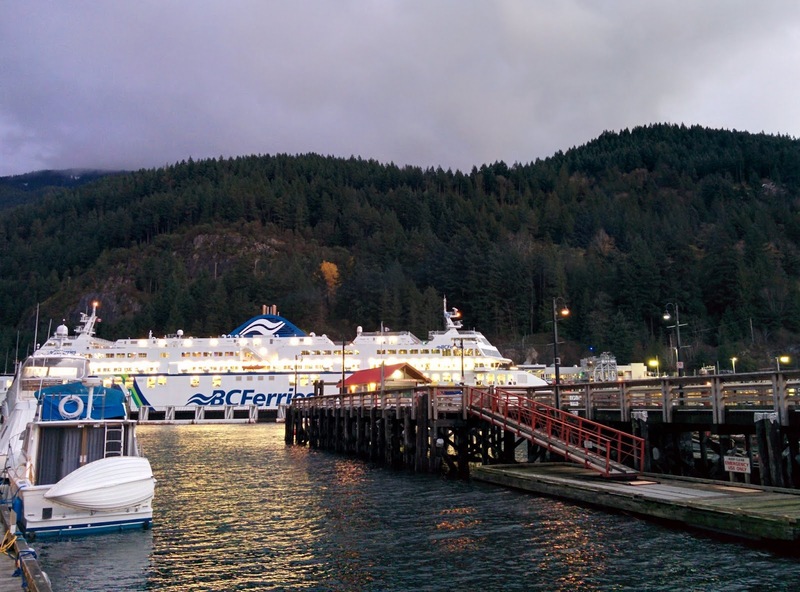 We headed back to Horseshoe Bay and it turned out to be just in time. Just as we had unloaded the boat, a huge wind storm came through. There was metal banging, trees swaying and things flying. We watched all this from the comfort of the Bay Moorings restaurant, since we all got together there for a drink and an appetizer and to swap stories. On the way home the highway was jammed. We noticed that there were many traffic lights out, and many homes dark. Later, we found out what happened. One of the hydro substations in North Vancouver exploded in a very impressive flash. Fortunately, our power was on, and we enjoyed the rest of the evening snug at home.